Aaaaah, my favourite soba noodles! I have them so seldom, because they are so expensive! 😀 While I believe that nothing compares to authentic Japanese soba ( buckwheat and wheat or pure 100% buckwheat noodles), here in the Czech Republic I choose to substitute them with the cheaper local buckwheat pasta. I´m actually happy we have such a great buckwheat-product brand, not every country is so lucky! 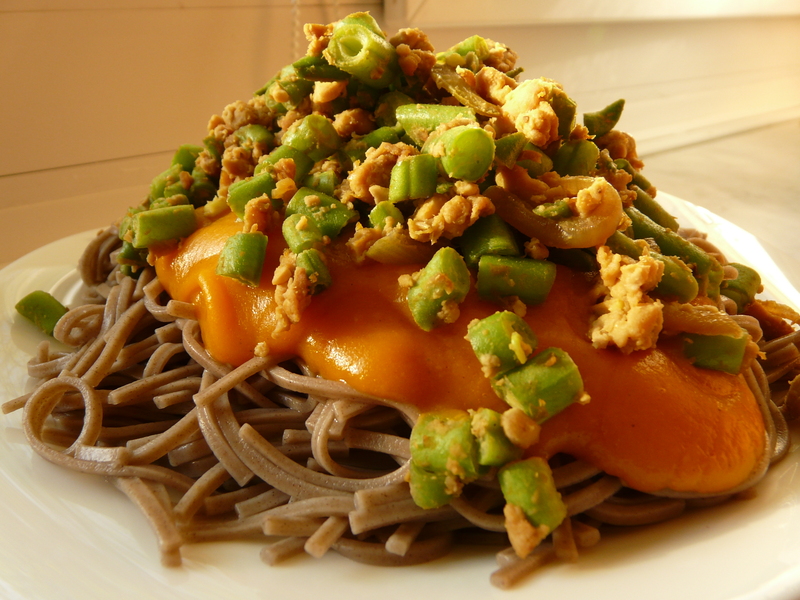 But here I used my long-saved stack of real soba, bought during our stay in Slovenia.. I made a sauce of long cooked cubed hokkaido pumpkin and onions – nearly cover the cubes with water and boil on low flame until soft. I seasoned the sauce with black Indian vulcanic salt and a generous amount of curry powder. I blended the sauce in a blender for a perfectly creamy texture. On a pan I sauteed on oil a bunch of green beans, cut into tiny pieces, along with crumbled up tempeh and a splash of shoyu soy sauce. I just boiled one smaller cauliflower head split into two halves (it needs about 10-15 minutes, submerged in salted water). For the sauce I cooked hokkaido pumpkin cut into chunks, and again, just enough water to submerge. You can cook this a bit longer than the cauliflower, together with grated brown rice mochi (for creamy texture), barley (or other) miso to taste, and a dash of lemon juice. Then blend until smooth and bring back to boil for a second. I also blanched the cauliflower leaves, since they looked nice (and again – here´s your fiber!) 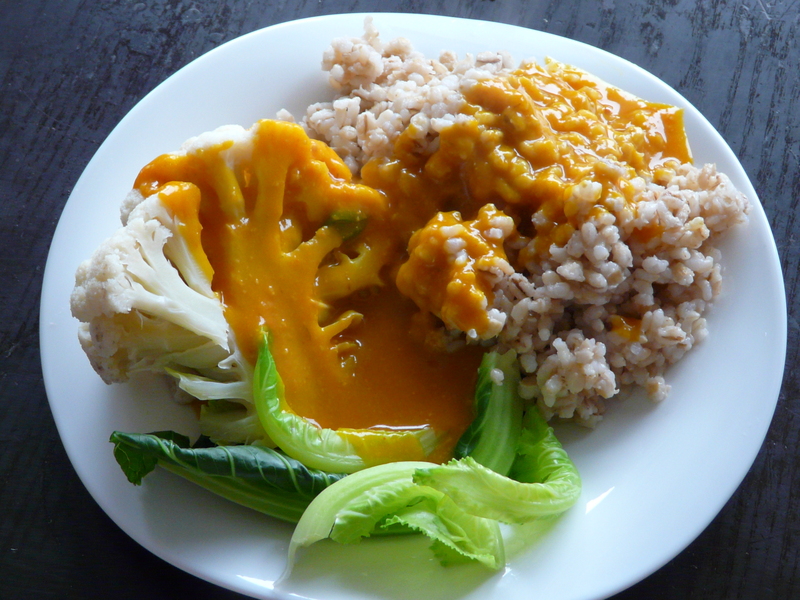 and served the meal with rice and barley mix.